For more than two decades, the Forest Field Program has advocated for sustainable and ecologically sound management of public forests in the Pacific Northwest. In the dry forests of Eastern Washington, ponderosas rise in thick spires like sentry’s looking over the countryside. In the understory, thick brush and a tangle of adolescent Douglas-fir trees block light from reaching young pine saplings. The parched ground is covered in brittle needles and sparse in natural forage. With the right weather conditions a stray lightning strike can spread fire through the undergrowth, into the upper canopy and across the dry landscape. Where the thick trees break, often the road begins. In addition to the routes important for our use of public forests, thousands of miles of poorly maintained and unsustainable roads snake along creeks and through our public wildlands, relics of an age of industrial extraction. Some of these roads provide access for those enjoying the great outdoors, but they also fragment critical habitat, creating a patchwork of isolated safe havens for elk and other wildlife. With each passing rainstorm roads collect and consolidate run-off, often driving sediment into nearby streams, choking fish eggs and aquatic insects, and filling pool and channel habitat. Finding optimism and solutions amongst the challenges in this landscape is all in a day’s work for Jen Watkins, George Wooten, David Heflick, Dave Werntz, and contract forester Derek Churchill of the Conservation Northwest Forest Field Program. From selectively thinning forests to closing and replanting unnecessary roads, the team works to restore our national forests and increase their ecological resilience. In turn, they’re improving forest management and making forests healthier and more sustainable for people and wildlife. In the post-World War II era, national forests were a means to “build America.” With a seemingly endless supply of timber, even old-growth forests were a source of profit and raw materials for construction and housing. “The mission after World War II was extract! Build roads! Get the wood out! Get it to the mill, build homes, help society develop,” said Dave Werntz, Conservation Northwest’s Science and Conservation Director. Even after the U.S. Forest Service (USFS) began to administer forests in part for wildlife habitat and outdoor recreation, management remained predominantly profit-driven. Old –growth forests were removed and sold as lumber, taking with it vital habitat for birds, insects, fish and wildlife. Natural wildfires, an important restorative event, were suppressed to protect the timber harvest. Then came a wake-up call. In 1990 the northern spotted owl was listed as an endangered species. Dependent on disappearing old forests for nesting, populations have dropped to well below half of historic levels. There are as few as 500 breeding pairs left in Washington state even today. Spotted owls are a Forest Service indicator species for old-growth forest health, so sharp declines in populations signaled dire conditions for a vast diversity of plants, animals, and fungi dependent on old-growth forest habitat. It highlighted a need for urgent action and new direction. In 1994, after years of advocacy from Conservation Northwest (then the Greater Ecosystem Alliance) and other environmental stakeholders, President Clinton signed the Northwest Forest Plan (NWFP), stressing scientific and sustainable forest management. The plan aimed to balance economic benefits with new protection for old growth and sensitive fish and wildlife habitat. For Werntz, the NWFP is one of the region’s greatest conservation achievements. The NWFP marked the transition towards science-based management of federal forests, a shift only possible after the timber industry had lost its social license to log old-growth forests, and growing public awareness of its massive ecological damage, including threats to endangered owls and iconic salmon runs. Logging practices evolved—mills transitioned to cutting smaller, younger trees and replanting them more effectively. In the years following the NWFP, the focus moved in the direction of long term conservation over short term profit. Conservation Associate Jen Watkins started work with Conservation Northwest’s forests program during this dramatic paradigm shift. She remembers when Okanogan-Wenatchee National Forest managers declared they no longer delivered board feet of wood, they delivered restoration. It was an evolution in rhetoric and policy. But there’s more in the forests than trees. While much of the remaining old-growth on federal lands in Washington may now be valued and conserved, too often the remaining undisturbed areas of our forests are isolated or negatively impacted. Fragmented forests divided by highways, excessive forest roads, degraded habitat or the sprawl of development prevent animals from finding mates, food, and suitable habitats as conditions change. With changing climate conditions and more pervasive wildfires, these changing conditions further underscore the need for forest management for ecological resilience, a principal goal of the Forest Field Program. And as more precipitation comes as rain rather than snow, flood events will be on the rise, meaning increased vulnerability of the roadbeds themselves and the impacts to natural resources. Lynx, which depend on the diminishing deep snow and particular forests for habitat, are especially reliant on forest management that aims to connect and protect habitat. Currently listed as threatened by the federal government and 13 states, lynx are holding on in Washington’s North Cascades and making use of the Kettle River Range in BC and Washington state. But as annual snowfall decreases that provide this species with its competitive edge, and disturbances such as fire pose risks to their already reduced and fragmented habitat, lynx will require options to seek replacement places to live for the short and long term. Without well-connected and healthy wildlands that offer these options, local populations may be trapped in inhospitable areas. For lynx, elk and other wildlife, as well as a growing human population that expects abundant outdoor recreation opportunities, every forest matters now more than ever, Watkins said. Even 20 years after the breakthrough Northwest Forest Plan was adopted, the forests that the Forest Field staffers work on still need attention. 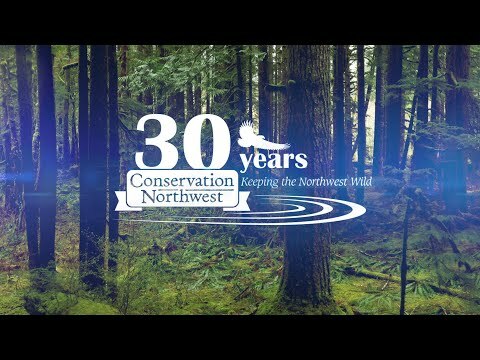 The Conservation Northwest team’s goal is to promote better forest and watershed management. The group recognizes the importance of responsible timber jobs for local, state and regional economies. They’re dedicated to managing forests so they can provide family-wage jobs, healthy fish and wildlife habitat, and a variety of recreational and public uses. In doing so, “we collaborate with the people working in the forests as well as local communities” said Werntz. The team tries to choose areas that can serve as a catalyst for change—but often those are areas where relationships need to be built to find common ground. Working with local communities to define a shared vision of sustainable forest management and demonstrate the value to both ecologically and human communities is critical, said Watkins. Each area is different, and conservation priorities are identified based on landscape conditions, its history of use and the needs of the wildlife living there. But Watkins notes that many forest restoration projects include one or more of the following: selective commercial and non-commercial thinning, prescribed fire in landscapes that historically evolved with frequent fires, an analysis of the road system to identify restoration opportunities, and watershed restoration actions ranging from placing woody debris in waterways within the project area to restoring native plant cover. Watkins and the forest team are currently working in the Little Naches watershed northeast of Mount Rainer National Park. Plans are in the works by Washington Department of Fish and Wildlife to reintroduce fishers to the national park. Members of the weasel family, fishers need mature trees for their dens. But years of extensive timber harvest in portions of the national forest that could provide great habitat for fishers are currently unsuitable, as dense homogenous young trees growing back in previous clearcuts. To recreate a habitat suitable for fishers, forest plantations need to be thinned to create variability in the pattern and structure along with space for the remaining trees to grow, Watkins said. “Similar to gardening in your yard, you often thin through rows of overplanted carrots early in the season to provide enough room for the remainder to grow bigger,” Watkins said. In habitat where large trees and forest structure are lacking to provide wildlife habitat, the Forest Field team engage in developing active forest restoration options including strategic thinning of trees to improve habitat faster for species such as the elusive and endangered fisher. As an added bonus, trees that are thinned to make way for mature forest growth and improved habitat can often be harvested, supporting local economies. Removing unnecessary roads requires a skilled and well paid work force. It’s one of the hidden benefits of ecological improvements: a restoration economy. Contrary to popular belief, resource-dependent economies and restoration can coexist. In the Forest Field team’s opinion, our Northwest forests are big enough for local jobs and wildlife alike. The Little Naches watershed is diverse in elevation and forest types with many wildlife habitat and watershed restoration needs. Spotted owls depend on habitat in the watershed, often in areas that are also fire prone. Valuable meadows that provide summer forage for elk shows signs of encroachment from trees due to lack of fire, disturbance from recreation, and an increase in invasive plants. Additionally this high priority watershed for salmon recovery and increasing natural water storage requires restoration of floodplain function and riparian habitats. Developing a shared vision for restoration that addresses these needs and the high priority social demands of this landscape requires a multi-dimensional approach and commitment to work with partners from project design through implementation. Thinking at the whole watershed scale provides an opportunity to do this. Scaling up from the watershed level, the team is also working with Colville National Forest who is re-imagining their forest plan for the first time in 20 years and the regional office of northwest forest’s as they prepare for the first revision of the NW Forest Plan. This is a chance to think about climate change, habitat connectivity, appropriate habitat protections, a sustainable road system, off-road vehicle use and watershed management, things that weren’t fully addressed and where our knowledge has changed substantially in the last few decades. One of the biggest problems the Forest Field team has to deal with has little to do with trees at all. Roads bring people into the forest. And along with responsible and well-intentioned visitors comes trash and fires and poaching and illegal timber or firewood harvesting, said Werntz. Roads also impair wildlife movement. While bigger roads like Interstate 90 isolate large populations of animals and lead to mortality and genetic stagnation, small roads have an unseen effect as well. Small mammals will avoid roads, limiting their movement within an area. Even large mammals like elk need roadless havens for calf rearing without the interruption from motors and the humans they carry. Most notably though, roads have no natural counterpart. Nowhere else in nature are there such smooth and impervious conduits. Roads direct runoff and rainwater into one channel, picking up debris and sediment in its fast-moving wake. This debris—many tons of sediment per year according to USFS geologists—is swept into rivers, smothering critical spawning grounds for threatened native fish. Flood events during storms can even lead to roads collapsing and entire hillsides being carried downstream. Roads have been linked to the frequency of large landslides, many of which contribute unnaturally heavy debris and sediment loads flowing into watersheds. The problem started with the commercialization of forests. Roads were hastily built for extracting trees, minerals and profits from forests as efficiently as possible with little regard for the impact they would have on the landscape, wildlife and people of the future. They were not built to last. “We borrowed against the future, and now we’ve got to pay,” Werntz said. Today, the Forest Service must manage thousands of miles of gravel and dirt roads prone to washout, collapse, bridge failures or other disrepair. The maintenance and supervision of these road systems puts a heavy burden on agencies already constrained by tight budgets. In the Cascades more than 8,000 miles of road wind through the Okanogan-Wenatchee National Forest and nearly 2,400 miles cross the Mt. Baker-Snoqualmie National Forest. While some roads carry people to trailheads, campsites or hunting or angling spots, much of this road system today serves little purpose. By 2015, the USFS aims to create an updateable motorized map, informing recreational users where they are permitted to drive and what roads are open. But closing a road is more complicated than simply putting up a fence. Road restoration can range from simply stabilizing the roadbed and deterring future public use to fully re-sloping and replanting the former road to blend back naturally into the surrounding landscape. It takes planning, skilled labor and expensive machinery to do this work. Community input and involvement from recreationists must be rigorous to ensure access remains for prized trailheads and other sites important for experiencing our shared natural heritage. Despite this community decision making, some people feel they have a right to unfettered motorized access, including on forest roads and trails slated for restoration that are redundant with other roads or posing significant risks to resources that are best addressed through their removal. Through our monitoring staff and interns have found it is not uncommon to come back a year later and find that ATV or ORV riders have illegally reclaimed a closed road, or have built a new trail going right around a locked gate or the boulders meant to limit damaging intrusion. Additionally new user-created routes are routinely created on our national forests stemming from existing roads. “It can often be a very principled fight, mile by mile,” says Watkins. She emphasizes that Conservation Northwest isn’t seeking to close all forest roads or prevent sensible motorized or recreation access. It’s the unnecessary and unsustainable roads, as well as those that are preventing wildlife from having adequate habitat on the landscape, that the group seeks to limit use or restore to a natural state. And it’s the unregulated, damaging and irresponsible motorized use they aim to reduce. The group’s Forest Field Program fights for conservation and restoration, but the public has a role as well. The USFS oversees large projects that change the landscape over thousands of acres and, according to Wooten, the public should know how and when they can participate in public comment sessions. Conservation Northwest’s membership and WILD NW activist base gives them the power to voice forest concerns and to enact change during public hearings, but individuals should also stand up for their favorite mushroom and berry patches, hunting spots and hiking trails, and even the forest roads they depend on for access. This information helps guide the work of Conservation Northwest and the planning of the USFS and district managers. Getting out and experience our public forests is equally important. The forest team believes that understanding, appreciating and celebrating our forests is one of the keys to saving them. Wooten’s house is near a 1,200 acre public forest which he knows intimately. He believes a tighter connection between the public, especially the youth, and the forests will foster progress and support the program’s work. Every day, he makes time to “recharge his batteries” and reconnect with the forests that he works to protect. It is his answer to the apathy that sometimes surrounds national forest management: get out, enjoy the landscape and give back to the wild places you enjoy. An abbreviated version of this article first appeared in our Spring/Summer 2015 Conservation Quarterly newsletter.